Broward Dermatology (Pembroke Pines) - Book Appointment Online! 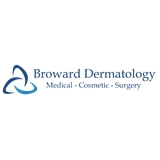 At Broward Dermatology in Pembroke Pines, Ran Huo, MD specializes in medical dermatology (including skin cancer screening, acne treatment, and wart removal) and cosmetic dermatology (chemical peels, laser treatment, and more). Everything we do is aimed at improving your skin, hair, and nails, which are reflections of your overall health and vitality. Patient comfort and satisfaction are our number one concerns. We will work with you attentively and conscientiously every step of the way for all of your medical and cosmetic dermatology needs. Our treatment devices and procedures are cutting-edge and scientifically proven. Dr. Ran Huo is a board-certified dermatologist trained in the latest medical and cosmetic skin technologies and procedures. Quick and great service. In and out and taken care of in a flash. Highly recommend.